JEJU CITY, Jejudo -- Team Time led by David Ko won the fifth Royal Salute Polo Cup at KPCC on Jejudo on Friday. Team Time beat Team Royal, led by Malcolm Borwick, one of the top professional polo players in the world and former captain of the British national polo team, in a two-day match that ended with Team Time winning 12 to 10 against Team Royal. Ko received the MVP award. Polo is still a relatively unfamiliar sport for many Koreans -- the country’s first polo club opened only in 2010. Since 2012, Royal Salute, a premium blended Scotch whisky brand owned by Pernod Ricard, has been sponsoring the annual Royal Salute Polo Cup, the first international polo event in the country. 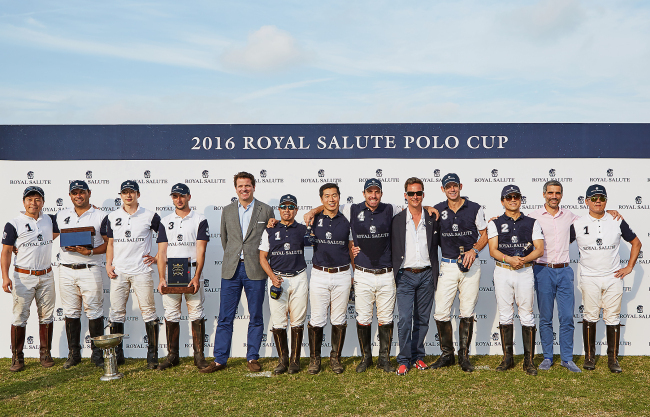 Royal Salute sponsors polo matches in 18 countries around the world. “I am very proud that we can also contribute to the development of Polo in Korea by continuously holding the Royal Salute Polo Cup here in Jeju,“ said Pernod Ricard Korea President & CEO Jean Touboul in his welcoming speech. “Both Royal Salute and Polo have maintained their original values based on deeply rooted traditions,” he added. Friday evening saw the 13th Duke of Argyll Torquhil Ian Campbell, who also serves as the Royal Salute brand ambassador, play host to an outdoor royal banquet held at KPCC featuring a traditional British menu prepared by celebrity chef Edward Kwon.